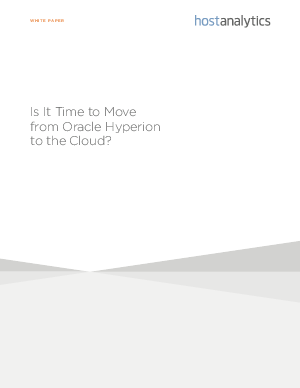 > Host Analytics > Is It Time to Move from Oracle Hyperion to the Cloud? While Oracle Hyperion remains a market leader in EPM software, that role comes with a hefty price tag and poses some hidden risks that have companies that use it re-evaluating their planning, budgeting, and consolidation needs. Whether used individually or together as an EPM suite, Hyperion Financial Management (HFM) and Hyperion Planning burden finance departments with a high cost of ownership, from server costs and consultants to dealing with the complex integration between products and the different interfaces. As Oracle Hyperion users start to evaluate the cloud, they need to be aware of how benefits of the cloud-based EPM solution compare to on-premises software. We’ve compiled this information to a) help you better understand the full costs and potential risks associated with Oracle Hyperion and b) offer guidance as you evaluate cloud-based options.